Our San Diego DUI lawyers welcome you. Each highly experienced San Diego attorney in California’s premier DUI defense firm stands ready to defend you against drunk driving charges in North San Diego County. Each San Diego DUI lawyer will represent you in the North San Diego Superior Court located in Vista, and will also fight for the return of your driver’s license at the DMV license suspension hearing in San Diego. 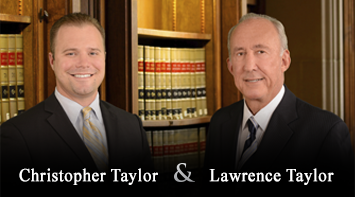 The Law Offices of Taylor & Taylor, a firm of 4 DUI lawyers (including 2 former prosecutors) with an average experience of 24 years, is widely regarded as the most respected DUI defense firm in the country. Each San Diego DUI lawyer will represent you in the North San Diego Superior Court in Vista, and will also fight for the return of your DMV license suspension hearing in San Diego. Each San Diego DUI attorney focuses entirely on the client facing DUI charges and a related DMV license suspension. The American Bar Association has twice featured the firm of DUI lawyers for its specialization as well as for its unique technical support staff of former DUI law enforcement personnel. And the firm has been awarded Avvo‘s highest ranking of 10 (Superb), as well as averaging 5 stars for client reviews on Yelp. The firm has consistently received the AV rating ( very high to preeminent in competence and ethics) from the Martindale-Hubbell International Law Directory - the highest rating possible and one shared by fewer than 7% of all attorneys in the U.S.
With offices in Carlsbad, Mr. Taylor is nationally known as the Dean of DUI Attorneys , and has been voted one of Southern California’s Super Lawyers by over 65,000 Southern California attorneys for the past 7 years. A former Marine, he is a graduate of the University of California (Berkeley) and UCLA Law School, and is a former prosecutor and Fulbright Professor of Law. He is the author of the standard textbooks on the subject, Drunk Driving Defense — the best-selling DUI text in the country, now in its 7th edition after 32 year of continuous publication — and California Drunk Driving Defense, the leading book among attorneys in San Diego and throughout California. 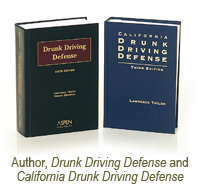 He has lectured at over 200 DUI seminars for DUI attorneys in San Diego and in 38 states. 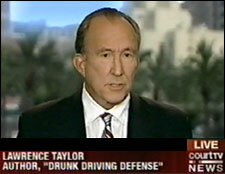 One of the original 12 founders of the National College for DUI Defense, Lawrence Taylor served as both Regent and Dean, and is today one of only 5 attorneys in California (and the only one in San Diego County) to receive the ABA-approved designation "Board Certified in DUI Defense Law" -- and the only one further designated "Senior Specialist". He is one of only two DUI attorneys in the country whose biography appears in Wikipedia, and over many years continues to be awarded the highest rankings from the most respected attorney guides: The Bar Registry of Preeminent Lawyers, AVVO and The Martindale-Hubbell International Directory of Attorneys. The firm is gratified to report that the U.S. Supreme Court, in publishing its long-awaited decision concerning warrants for drawing blood samples (Missouri v. McNeely), has regognized Lawrence Taylor’s best-selling textbook Drunk Driving Defense as authority in the drunk driving field. From the Firm’s offices in Carlsbad, our DUI defense attorneys defend clients charged with DUI in Oceanside, Fallbrook, Vista, San Marcos, Escondido, Encinitas, San Marcos, San Clemente, Camp Pendleton and throughout San Diego County. The Firm also represents our clients at DMV driver’s license suspension hearings at the DMV Driver Safety Office in San Diego. We invite you to meet our DUI attorneys and review their experience and qualifications, and to call our Firms founder, Lawrence Taylor; our Managing Attorney, Chris Taylor; or our Client Services Attorney, Saman Manavi, for a free consultation. For general information on DUI attorneys' fees, we recommend that you read " What will it cost to retain a DUI lawyer to defend me?" an attorney to represent me?